In the midst of stress, there is connection. In the midst of sorrow, there is laughter. In the midst of fatigue, there is anticipation. In the midst of loss, there is appreciation. In the midst of chaos, there is the act of kindness that matters because of its mere existence. In articles about dealing with stress, the idea of gratitude is repeated over and over again. Whether or not it is an active strategy, I find that gratitude and its cousin appreciation bubble up so easily these days. Perhaps because I need more help I have more to be grateful for. Or perhaps the contrast makes my appreciation keener. Or maybe I’m always this way and I just don’t usually pay as much attention. It is hard to know. I stood in the grass at Shoreline Amphitheatre this weekend, my vest zipped up against the cool evening air. I watched Passion Pit play their song “Take a Walk,” and I was so happy to be there. I watched a friend of mine win the Andre Norton Award on Saturday night, and in the middle of tearing up, I was so happy to be there. I ate a late evening snack at my favorite local crepe place with a group of friends old and new, and I was so happy to be there. 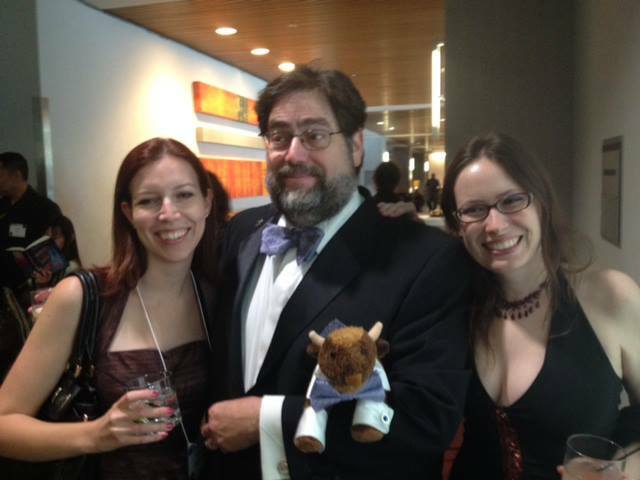 My Taos buddies and I at the Nebulas this weekend. Photo by Valerie Schoen. A friend told me this weekend about a friend of hers who read my blog post about stress last week. Apparently it had a big impact, being the right post at the right time for this friend, who has been going through a lot herself recently, but she was embarrassed to write and tell me. I laughed and said, “I was embarrassed to write that post too.” I am so happy I decided to write something that mattered to someone. I am so happy that so many of you have reached out to offer support and tell me it’s totally fine to spend some time staring at trees. And I completely agree. Staring at trees can be pretty great. So can eating pie and reading fluffy novels and petting little dogs and wearing a fantastic dress. I am so happy to be here right now. I am always looking for reasons to be happy, and I found so many of them this weekend. And perhaps that’s what I feel the most grateful for: my ability to find those reasons, and your willingness to create those reasons with me. Thank you again for your awesome writing and expressing something many people have a difficult time expressing! I spent an hour last weekend just listening to the radio, just listening, something I haven’t done for a long time and realized how much I’m missing. Your happiness spills out of this computer monitor. One cannot help but smile seeing this entry. Hugs! It was a wonderful weekend and this is a beautiful post.